A large number of visitors flock to this picturesque place, especially during the holidays and pilgrimage seasons. Many city dwellers travel to this natural park and erect tents for a few days, especially during the weekend. This is a peaceful escape for them from the hustle and bustle of city life. They spend their free time enjoying the beauty of nature and fresh air in the company of their family. Al-Baida is a beautiful place surrounded by huge mountains. For this reason, Al-Baida has become a favorite destination for Haj and Umrah pilgrims from all over the world. They are eager to visit the place, which is popular thanks to social networking sites including YouTube. According to these reports, Al-Baida valley is known as Wadi Al-Jinn, because the power of jinn is supposed to be present in this place. There are a lot of myths about this valley. Vehicles in this valley reportedly move upward without any need to push the accelerator pedal. If one enters the Wadi and switches off his car engine, it will apparently start going in reverse. It is also claimed that the mountains in this region have some magnetic powers. On a visit to the valley, Arab News saw many visitors conducting such experiments with their vehicles. Most of the visitors in Al-Baida were Umrah pilgrims from Pakistan, Turkey and Indonesia as well as those from other GCC states. They came to visit the place after having found out about the place well before arriving in the Kingdom. Some of them were seen carrying location maps of Al-Baida. There are several local residents who cash in on this by arranging transportation for pilgrims and visitors to the Prophet’s Mosque to and from Madinah and the wadi. Owners of buses and private vehicles charge visitors exorbitantly to visit this tourist spot. The fare for a private vehicle trip ranges between SR100 and SR150, while buses charge SR20 to 40 to each passenger. Meanwhile, a number of Madinah citizens have urged the Commission for Promotion of Virtue and Prevention of Vice (Haia) to urgently intervene and stop tour operators from exploiting Umrah pilgrims by spreading rumors about Al-Baida. 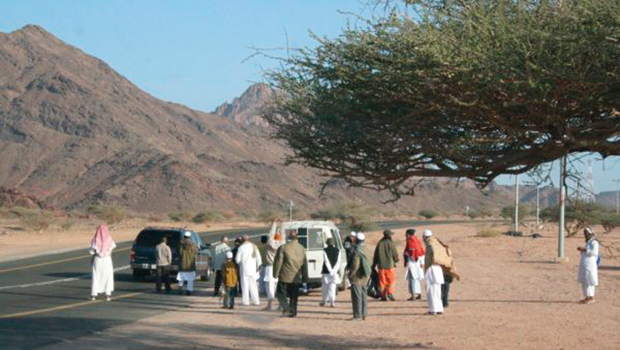 Speaking to Arab News, citizen Ahmad Al-Matrafi said the Haia has to intensify inspection tours in the area and prevent private taxi operators from exploiting pilgrims by spreading such rumors. “Signboards that aim to notify visitors about these drivers should be set up in the area,” he said. Al-Matrafi also urged the Madinah branch of the Ministry of Haj to make pilgrims aware of this type of exploitation. Dr. Abdullah Al-Amri, president of the Saudi Geological Society, told Arab News that this phenomenon, known as reverse gravity, is also evident in other regions in the Kingdom, including the southern regions of Asir and Najran. “This is regarded as a natural phenomenon taking place usually inn some rocky mountainous regions,” he added.